Next Beginners Course starts on 19th August! 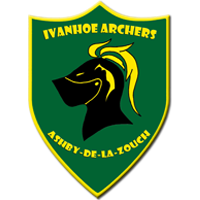 Ivanhoe Archers a small but friendly Archery club based here in Ashby de la Zouch, Leicestershire. All skill levels and ages are welcome. We have a great family atmosphere. Have a go sessions and beginner courses are available. We shoot 4 times a week during the outdoor season; these are Tuesday and Thursday evenings, Friday evenings for Juniors and Parents plus Sunday mornings. The out-door season runs from April until the end of September, in-door October to March. During the indoor season we only shoot Saturday and Sunday evenings and for the ones not scared of weather Sunday mornings too but outside. Nothings quite like archery on a snow covered field. This makes it one of the few sports that do run all year round. 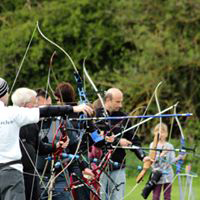 Within our current members we have a very broad spectrum of skill and ages and bow styles used, so you would never be the only one shooting your style or level. We are also happy to give advice and share our experiences as well. 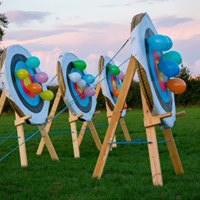 Don’t just think about trying Archery, give it a go! Ivanhoe Archers is proud to be associated with Archery GB and is a registered ontarget club. 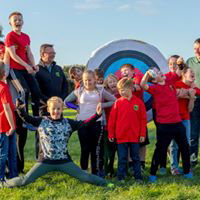 Ivanhoe Archers Ashby de la Zouche is a friendly Archery club with a dedicated Junior section – the Ivanhoe Knights. All skill levels and ages are welcome. We have a great family atmosphere. Have a go sessions and beginner courses are available. Contact us to find out more.